Yesterday I drew this game in the game/45 Swiss tournament at Chess Mates. 36.Be2 Qa1+ 37.Kf2 Qh1 38.h4 g6 39.Qf3 Qc1 40.Qd3 cxb4 41.axb4 Qb2 42.h5 Kg7 43.hxg6 Qxb4 44.Qd4+ Kxg6 45.Bd3+ f5 46.Ke2 Qc5 47.Ke3 Qxd4+ 48.Kxd4 Kh5 49.Be2+ Kg6 50.Bd3 Kh5 51.Be2+, draw. My Review of "Chess Variants & Games"
The book Chess Variants & Games for Intellectual Development and Amusement by A.V. Murali has nothing to do with the game of chess as we know it. Rather, it is an imaginative attempt to create chess variants with triagonals instead of diagonals, and to use chess in education to teach language, mathematics, chemistry, physics, and more. There are sports related games involving chess for basketball, table tennis, squash, cricket, and volleyball. Would you like to solve a chess crossword puzzle or a chess sudoku? In the preface, the author explains "how the idea of writing this book occurred to me. It all started when I happened to walk along a pavement tiled with stones in the shape of a hexagon." This inspired him to wonder whether chess can be played on a hexagonal board and to consider various other geometries, as well. Time and again, I was impressed by the amount of independent thinking and research in this book. On Wednesday, Mauricio Camejo won the September Game/90 tournament at Chess Mates. 15.Nb6 Rxf5 16.Rxf5 Nc5 17.Nxa8 Nxb3 18.axb3 exf5 19.Nb6 d4 20.Nxc8 Qxc8 21.Bf2 Bf6 22.Qd3 Ne5 23.Qxa6 Qxc2 24.Qe6+, Black resigns. 47.Rc3 Kd7 48.b5 Re7+ 49.Kf2 Re6 50.Re3 Rxe3 51.Kxe3 Ke7, draw. 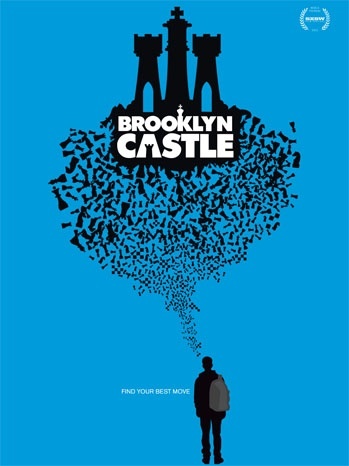 Watch the official trailer for Brooklyn Castle. Help bring Brooklyn Castle to the people. In week four of the U.S. Chess League, the roll of the dice came out snake eyes for the Carolina Cobras, losing last night's match versus the New Jersey Knockouts. The moves to the games (boards one, two, three, and four) can be seen here. On Sunday, I finished with a score of 2-0-2 in the game/45 Swiss tournament at the Marshall Chess Club. 18.Bc6 Ra5 19.Rd5 Rxd5 20.cxd5 Bd7 21.Rd4 b5 22.Rb4 Rb8 23.Qc2 Bxc6 24.Qxc6 Rb6 25.Qa8+ Qf8 26.Qa7 Qb8 27.Qxb8+ Rxb8 28.Kf1, draw. There were 20 players in yesterday's grand prix tournament at Chess Mates. 49.f6 Qf1 50.f7 Qxg2+ 51.Kh8 Qf3 52.Kg7 Qg3+ 53.Kh7 Qf4 54.Kg7 Kd3 55.f8=Q Qxf8+ 56.Kxf8 Ke4 57.Kf7 Kf4 58.Kf6 Kg3 59.Kg5 Kxh3 60.Kf4 Kg2, White resigns. What Happened to "Atlantic Chess News"? The latest issue of Atlantic Chess News was published in 2010! Tomorrow morning, I am scheduled to teach my inaugural class for Columbia Academy. The chess lesson will take place at Caldwell College in Room 107 of Aquinas Hall, from 9:30am to 10:30am. After briefly discussing piece values and the rules, I will move on to the general principles that need to be followed in the opening, middlegame, and endgame. This first class is free for new students! Last night, in week three of the U.S. 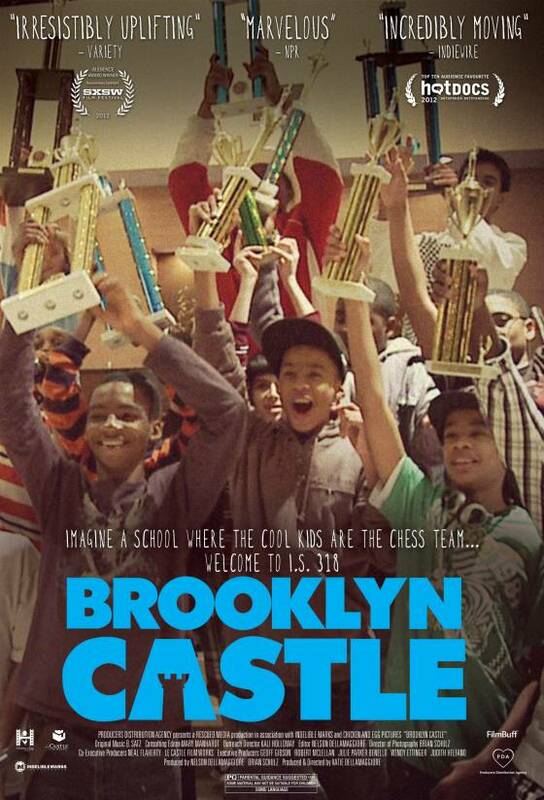 Chess League, the Philadelphia Inventors played to a tie against the New Jersey Knockouts. Look at the games on boards one, two, three, and four. After two rounds, here are the standings in the FIDE Mondays tournament at the Marshall Chess Club. # Name Rtng Post Rd 1 Rd 2 Tot . 1 FM CARLOS E MENA 2462 2466 W32 W13 2.0 . 2 FM RAWLE A ALLICOCK 2344 2353 W26 W14 2.0 . 3 YEFIM TREGER 2232 2243 W27 W17 2.0 . 4 JUAN SENA 2226 2237 W21 W15 2.0 . 5 FM NATHAN RESIKA 2226 2235 W22 W20 2.0 . 6 JAMES R WEST 2200 2211 W23 W16 2.0 . 7 BENJAMIN KATZ 2182 2204 W33 W11 2.0 . 8 ARTHUR M MACASPAC 2135 2139 W34 H--- 1.5 . 9 PAYAM PARHAMI 2094 2097 W31 H--- 1.5 . 10 PAUL RACHLIN 1882 1886 H--- W25 1.5 . 11 IM JAY RICHARD BONIN 2420 2409 W19 L7 1.0 . 12 FM CARLOS PUJOL 2385 2364 L20 W30 1.0 . 13 CONRAD HO 2157 2156 W28 L1 1.0 . 14 JOEL JESUS HERNANDEZ 2128 2125 W29 L2 1.0 . 15 SARATHI RAY 2104 2099 W35 L4 1.0 . 16 CHARLES MCMILLAN 2070 2062 W36 L6 1.0 . 17 ZACHARY H COHN 2053 2047 W24 L3 1.0 . 18 FRANK ASHMUN 2052 2029 L25 W33 1.0 . 19 OLEG SHEVELENKO 2039 2043 L11 W34 1.0 . 20 EDWARD P KOPIECKI 2039 2059 W12 L5 1.0 . 21 EDWARD SCHER 1900 1905 L4 W35 1.0 . 22 SZYMON RUDOWSKI 1897 1893 L5 X36 1.0 . 23 ALISHER PODAVONOV 1892 1910 L6 W32 1.0 . 24 ANIL K MARTHI 1598 1599 L17 W37 1.0 . 25 LEONID MYKHAILEVSKYI 1550 1576 W18 L10 1.0 . 26 WCM RACHEL GOLOGORSKY 2027 2023 L2 H--- 0.5 . 27 EDWARD A FRUMKIN 2000 1987 L3 D28 0.5 . 28 HAL DIFEDE RIVES 1842 1844 L13 D27 0.5 . 29 JONATHAN HAINS 1765 1761 L14 H--- 0.5 . 30 TESEO L TORRAS 1682 1681 H--- L12 0.5 . 31 JOSHUA WONG 1668 1665 L9 H--- 0.5 . 32 MICHAEL LAYEVSKIY 2040 2015 L1 L23 0.0 . 33 MULAZIM MUWWAKKIL 1855 1843 L7 L18 0.0 . 34 JERMAINE REID 1828 1816 L8 L19 0.0 . 35 STEPHEN SEUNARINE 1739 1726 L15 L21 0.0 . 36 NADAV BERENSTEIN 1600 1598 L16 F22 0.0 . 37 RUBEN [filler] COTTI-LOWELL unr. 1198 U--- L24 0.0 . 31.f8=Q Rhxf8 32.Qg7+ Be7 33.Bg4 b3 34.Qxh7 Rf1+, White resigns. Candidate master Larry Tamarkin [pictured, left] is writing a book about international master Jay Bonin [pictured, right], to be published by Ishi Press. Please send your games against Bonin by e-mail to larrytamarkin@hotmail.com, or post the games at Tamarkin's Facebook page. Rumor has it that you will be paid $1 per game. On Saturday, I won this game with a discovered check, in the under 2300 tournament at the Marshall Chess Club. 30.e5 Qxe5 31.Bxc6 Rxf2 32.Qd5 Qxd5 33.cxd5 Rf3+ 34.Kh2 Rxf1 35.d6 Bg1+, White resigns. At the Olympiad in Istanbul, Phiona Mutesi attained the FIDE title of woman candidate master. In week two of the U.S. Chess League, the New Jersey Knockouts looked sluggish (with three draws and one loss) in their match against the Seattle Sluggers. On Wednesday evening, I played a knight and pawn ending at Chess Mates. 49.Nc6+ Kxb3 50.axb5 Nxb5+ 51.Kc5 a4 52.Na5+ Kc3 53.Kxb5 a3 54.Ka4 a2 55.Nb3 Kb2 56.Kb4 a1=Q 57.Nxa1 Kxa1, draw. For many years now, I have observed a strange pattern of behavior at chess tournaments. Players wearing earplugs, attached to electronic devices that supposedly are playing music, seem to perform at least 100 points higher than their published ratings. I have seen this, not only in my own games but in games being played next to mine at tournaments. Here are a blog post and article that add to my worst suspicions. 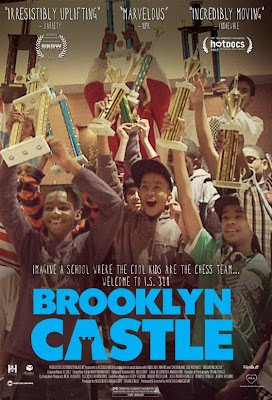 Fund Screenings of "Brooklyn Castle"
The documentary film Brooklyn Castle needs your financial assistance to fund screenings. Last night at the Marshall Chess Club, my opponent sacrificed a pawn in the opening. 32.Rb7 Nd6 33.Rd7 Nf5 34.Ra1 Ke8 35.Rb7 Nd6 36.Ra8+, Black resigns. After taking photos at Roxy & Dukes Roadhouse on Saturday afternoon, I drove to the Marshall Chess Club where I played this game. 29.Rb6 Nd8 30.Ra1 Kg8 31.Ra8 Bd7 32.Bxb7 Nxb7 33.Rxe8+ Bxe8 34.Rxb7 Rh6 35.Kg3 Rg6+ 36.Kf2 Rh6 37.Kg3, draw. Yesterday afternoon, Michael O'Connor [pictured] and his band Mikell's Plot rocked the house during Bandfest 2K12 at Roxy & Dukes Roadhouse in Dunellen, where I snapped these photos. On Wednesday evening, Michael rolled his higher rated opponent with sharp tactics at Chess Mates. 15.Rfd1 Ra8 16.Nd4 Nxd4 17.Rxd4 Qe8 18.Rc7 Nc6 19.Rd1 Rf7 20.Bc5 Na5 21.Bxe6 dxe6 22.Rxf7 Kxf7 23.Qc7+ Kg6 24.Rd3 Qg8 25.Rg3+ Kh6 26.Qf4+, Black resigns.